The cat rescue business has been pretty busy these past few days. I have had four rescues in the past six days, and it would have been five rescues if one of the cats had not found his way down on his own during the night. So it was not much of a surprise when I got the call from Kelly. 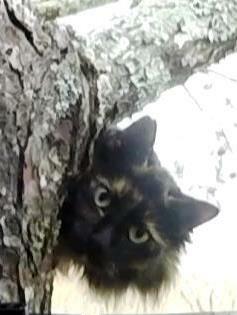 Kelly told me that there was an unknown cat that had been stuck in a tree for six days in Gonzales. The homeowner, Debbie, who found the cat in her yard called Cara's House, a companion animal rescue organization for the parish, to see if they could help. It was Kelly who answered the phone that day, and that call started the search for someone who could get the cat down. Kelly called the sheriff's office, and they came out to look. Unfortunately, despite their good intentions, they succeeded only in scaring the cat even higher. Kelly called several tree care companies, but no one wanted to help. Eventually, one of Kelly's colleagues at Cara's House learned about it and told her about me. No one in the area recognized the cat, and there were no reports of a missing cat that fit the description. 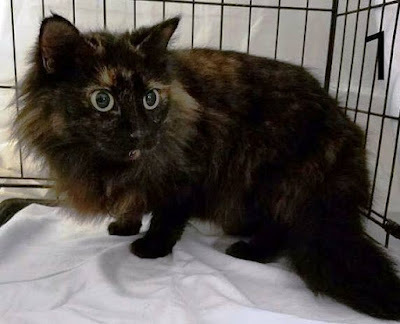 Honestly, my heart sinks a bit whenever I learn that the cat I am about to rescue is unknown. I always assume it is feral and, therefore, unlikely to be the least bit cooperative. That makes for a long and difficult rescue, but I am always willing to take on that challenge. When I arrived at the site, I met Kelly and Debbie who led me to the tree. It was a tall pine tree, and pretty near the top I could see the cat resting about 50 feet high. 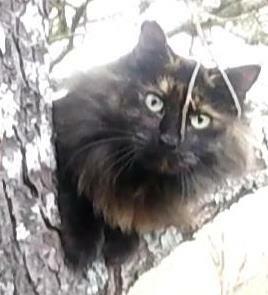 The cat was resting on the highest branch that was suitable for use as a tie-in point for my rope, so I would need to set my rope below him and advance up to him. That would have been a good strategy anyway, since it would be less scary for the cat if all the commotion took place below him. While the cat was quiet when I arrived, Debbie told me that he cried often during the days before. That was encouraging to me, since feral cats are typically quiet and do not want to call attention to themselves. A cat that cries to a person is more likely to be at least somewhat tame. But I was still concerned that he would climb higher up the skinny top of the tree and get out of my reach. I really wanted to do everything I could to make sure I gave the cat no reason to be afraid of me and climb higher, so I took my time climbing and tried to make as little commotion as possible. There were several small limbs that I had to break off to clear a path upward, but the cat seemed to be handling everything just fine. As I got closer, I spoke calmly to the cat and he watched me with concern but not alarm. He was staying in place, and I was feeling encouraged by his response. I paused often to give him time to adjust to my presence, and I looked at him only occasionally so that he would see that my focus was not on him as it would be for a predator. 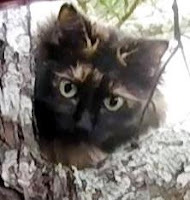 Often I have found that cats that have been in a tree a long time are more interested in water than food. So when I reached a point where I was almost arm's length away from him, I let him watch as I poured some water in a bowl. I held it up to him to see if he was interested. He looked but made no movement toward it. Even though he showed no interest in drinking, I was encouraged that he was not frightened by my hand being so close. I pulled the water away, waited a while, and then offered it to him again. Again, I got the same response. Since he was not interested in the water, I decided to try food. While he had no response to the sound of the can opening, he did respond when he smelled the food. When I held it up to him, I could see some interest and energy building up in him. He took his time, but he sniffed it and then pulled back. I pulled myself up a little higher so that I could reach him better and then offered the food to him again. This time he sniffed it and then tasted it. He must have liked it, because he took some more bites. Once I saw that he liked the food, I knew I had him. I put the food in the back of the carrier and held it up to him above my head. I could not see him very well, but I could tell he was not going in it. He sniffed the opening of the carrier and he looked inside, but he did not go in. I tried to give him several opportunities to go inside, but each time he refused. I put the carrier away and prepared to scruff him into a bag instead. First, however, I had to go up a little higher to reach him better, and I also had to get him to allow me to touch him. He was not alarmed when I climbed a little higher. Now I could reach him better, so I extended my hand to his face, and he sniffed it. I gently touched his cheek, and he was comfortable with that. I petted the top of his head, and he appeared to like it. He seemed less comfortable, however, when I touched his back end, so I continued to focus on his head and make sure to establish more trust. Eventually, I could touch his upper back, and he continued to remain comfortable. I massaged his shoulder and neck and found a scruff I could use. I picked him up and was very pleased to see that he relaxed and did not struggle against me. I easily pulled the bag down over him and secured him. He remained quiet and motionless the entire time. I took him down and handed him off to Kelly. She and Debbie took him back to the carport to get out of the light rain that had just started. I disconnected and got my microchip scanner and joined them. While the cat was still in the bag, I scanned him thoroughly for a chip but did not find one. Kelly held him in her lap and let him poke his head out the bag while she held him tightly to keep him from escaping. He didn't try to escape and seemed fairly comfortable there in her lap. She then took him to Cara's House where she could give him some fluids, check him out and give him a temporary place to stay. The next day, Kelly told me that the cat is a female and is very sweet. Kelly named her Lillian. She is doing very well and will be kept there at Cara's House until someone either claims her or adopts her. If you are looking for a sweet cat to adopt, please consider giving this pretty, long-hair, torti girl a chance at a better life.